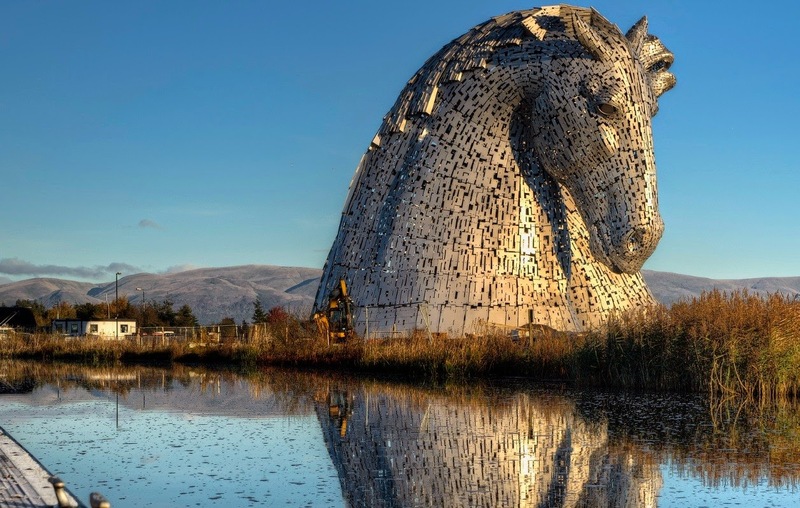 The giant sculpture is towering 30 meters (approximately 100 feet) above the ground, The Kelpies consists of a pair of mammoth horse head sculptures installed by artist Andy Scott in Falkirk, Scotland. 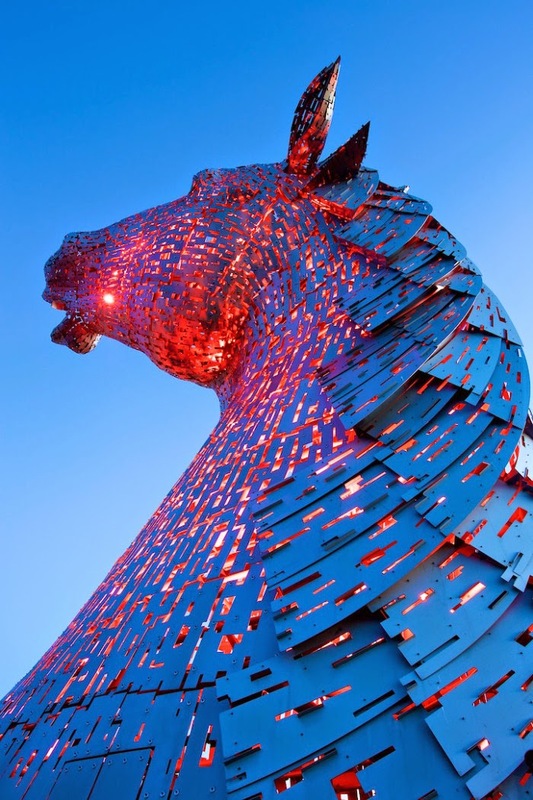 The Scottish artist almost spent a total of 9 years designing and then assembling the sculptures on-site, crafting steel parts into intricate busts that allude to the legendary Scottish water spirit that takes the form of a horse. 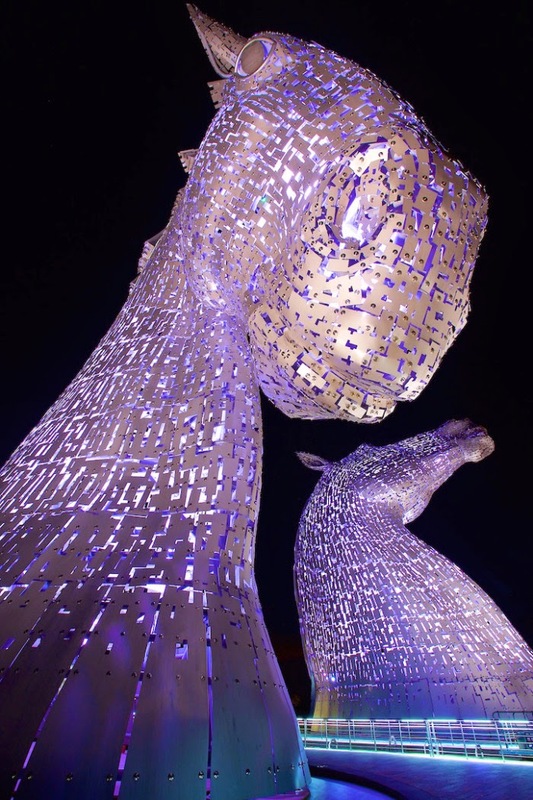 The Kelpies project was undergoing construction from long time in The Helix Park, but as these spectacular images taken by photographer dswain display us, the canal site has been transformed entirely to complement the dynamic grace of the sculptures since the installation was opened to the public in April 2014. 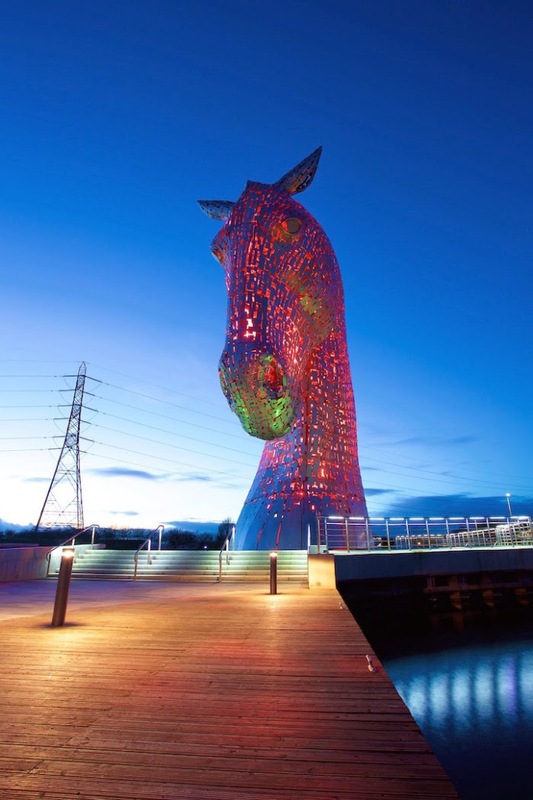 Moreover; the colorful lights around and inside the steel works illuminate their superlative shapes in the darkness, additionally increasing the beauty of the Scottish landscape. 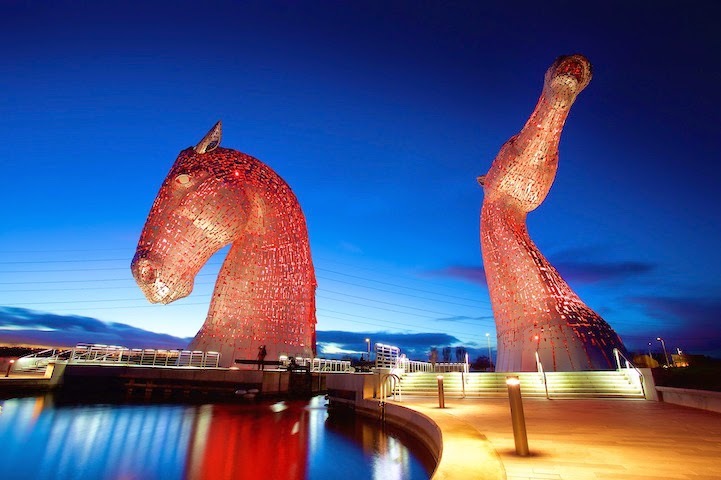 For artists, the project's location finally decided to in his father's hometown of Falkirk, the cultural tale of kelpies, and Scotland's industrial past compelled him to take on the project as a source of national pride. 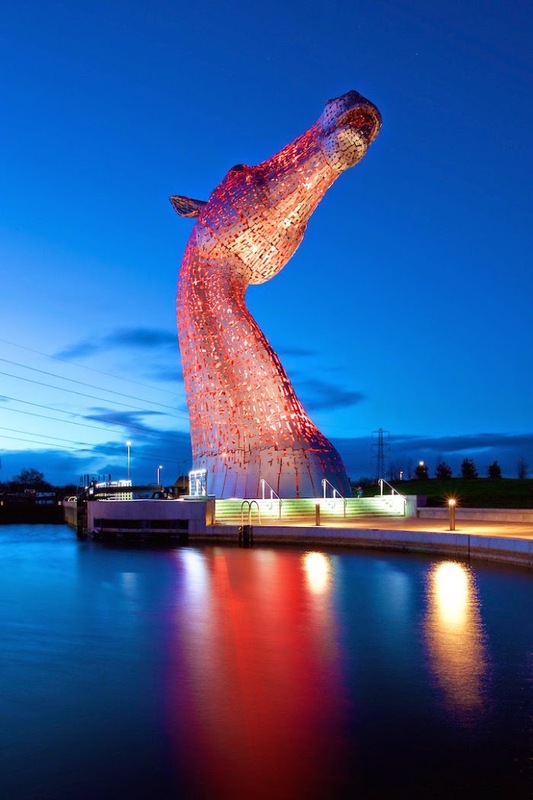 The Scott determined to build around a contemporary sculptural monument. 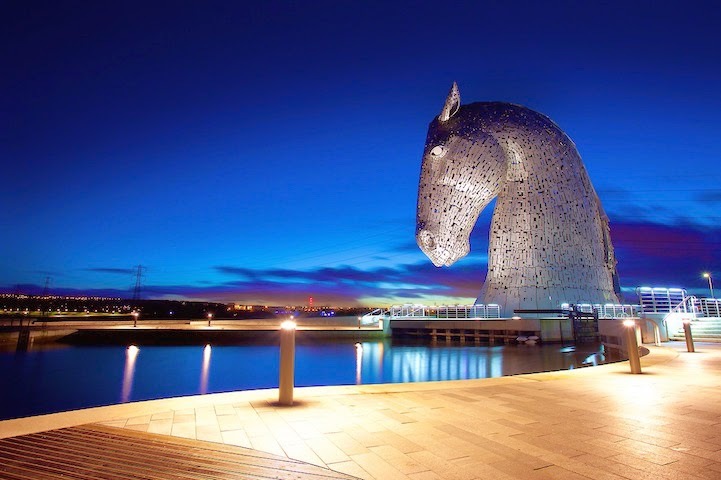 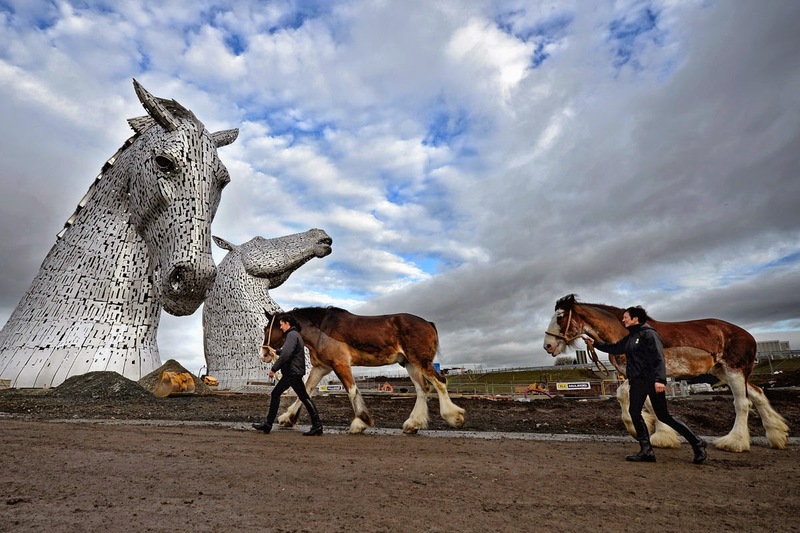 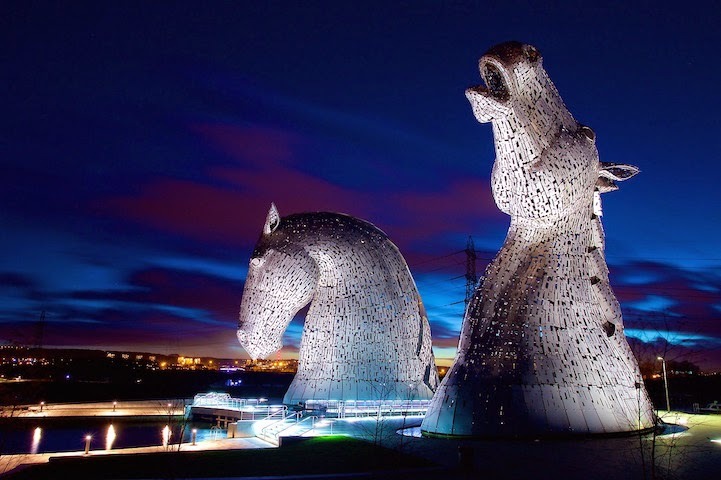 Water-borne, towering gateways into The Helix, the Forth & Clyde canal and Scotland, translating the legacy of the area into honored equine guardians he say; I see The Kelpies as a personification of local and national equine history, of the lost industries of Scotland. 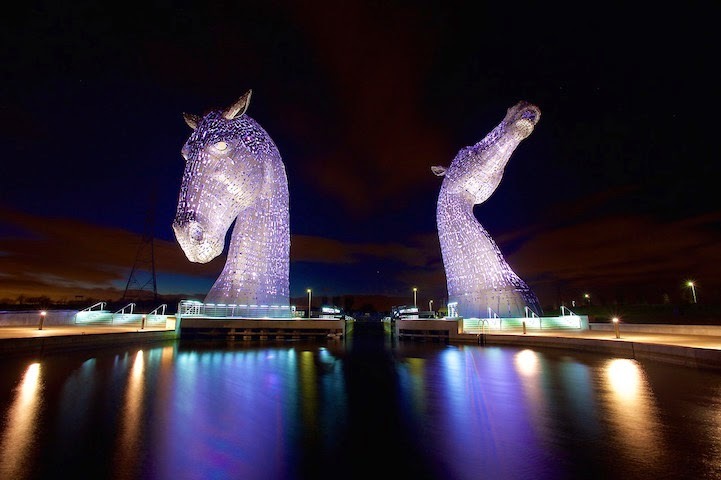 I also visualize them as a symbol of modern Scotland full of pride and royal, of the people and the land. 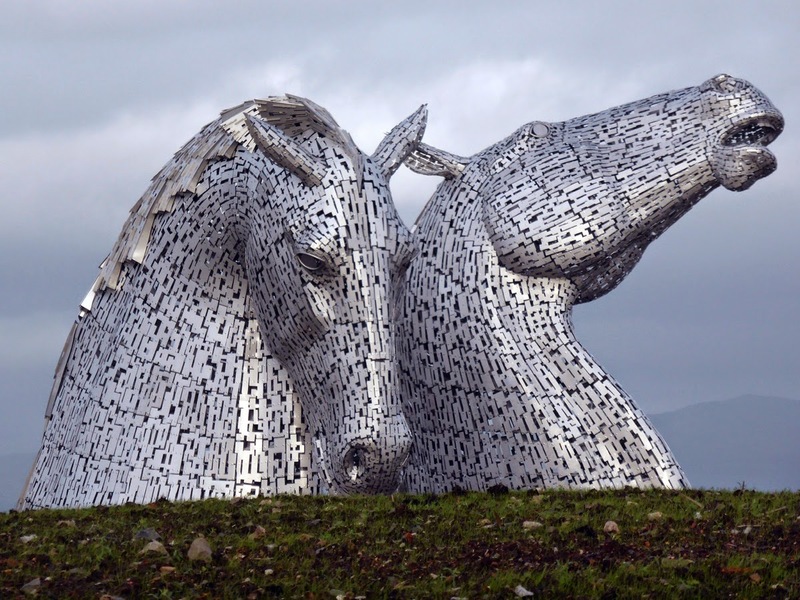 They’re the culmination of cutting edge technology and hand crafted artisanship, formed by our country's leading authorities through international partnerships." 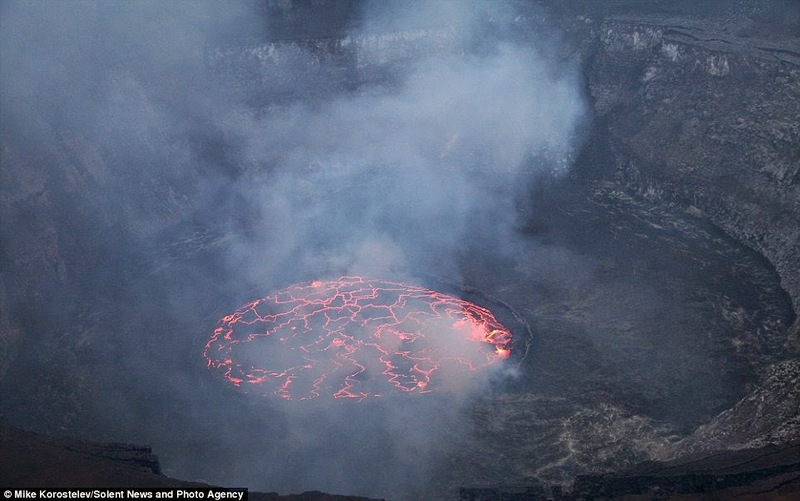 You would be thinking that the last place on earth where people would want to inhabit to the bottom of a steep volcano hosting the world's largest fluid lava lake. 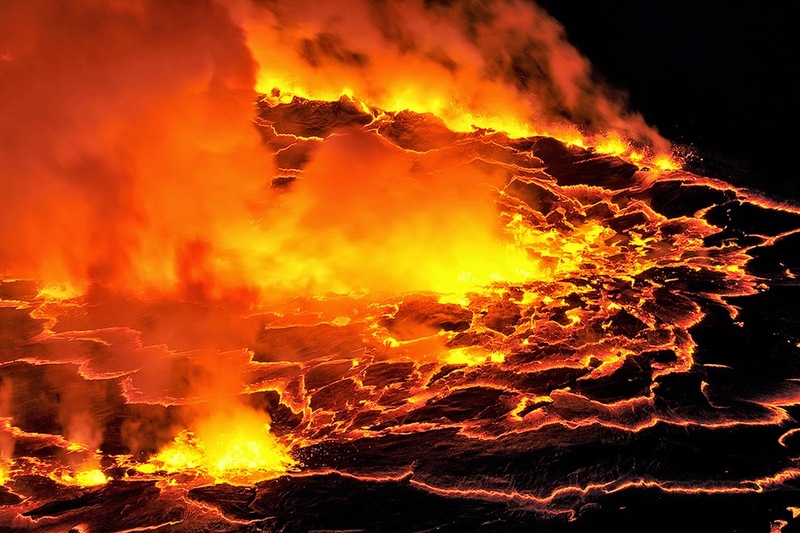 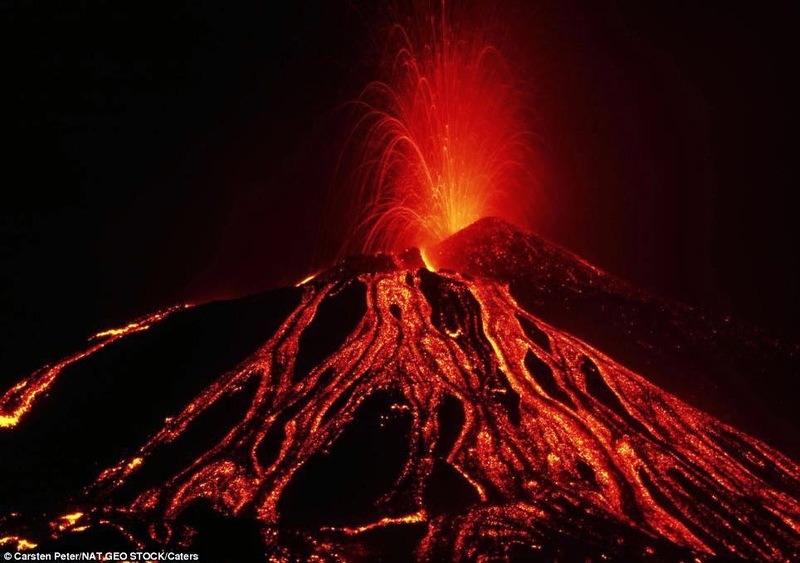 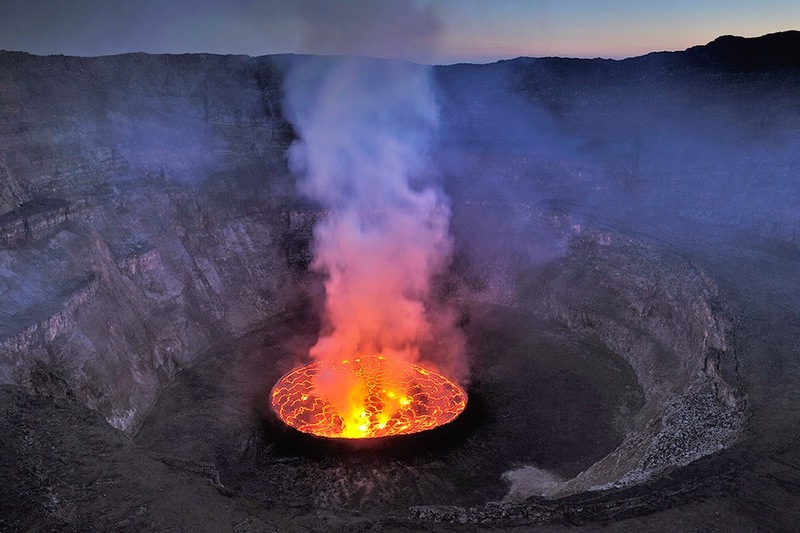 Mount Nyiragongo Virunga National Park Democratic Republic of the Congo is an active volcano and very famous for housing the biggest lava lake in the world. 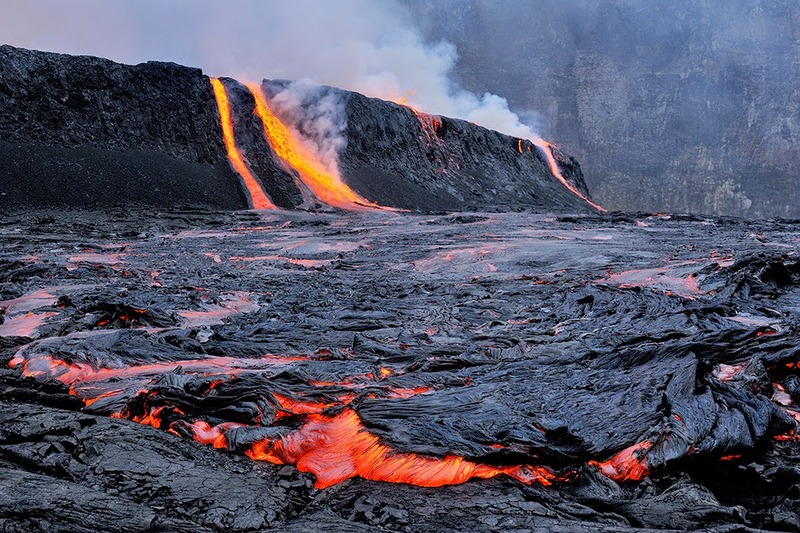 The volcano’s slopes are steep and lava is very fluid, thus enabling it to flow in high velocity when it erupts. 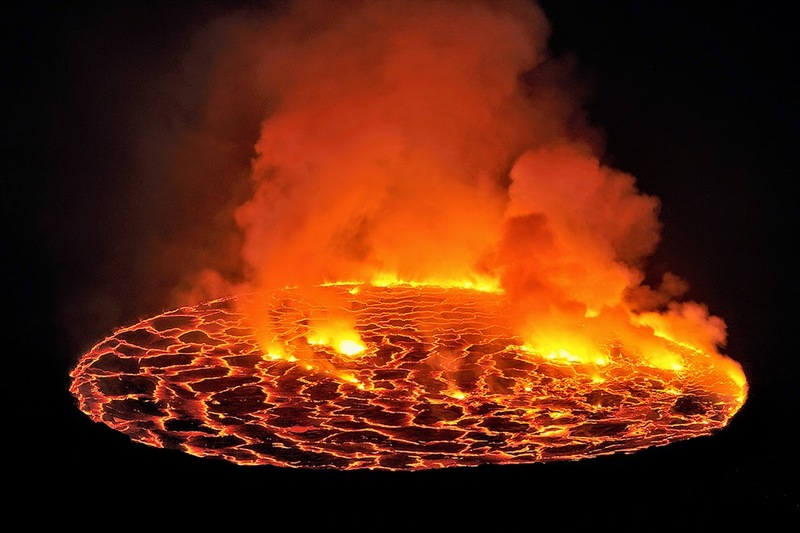 In spite of the continuous threat of catastrophic fiery death, the area at the foot of Mount Nyiragongo is dotted with greatly populated bustling villages. 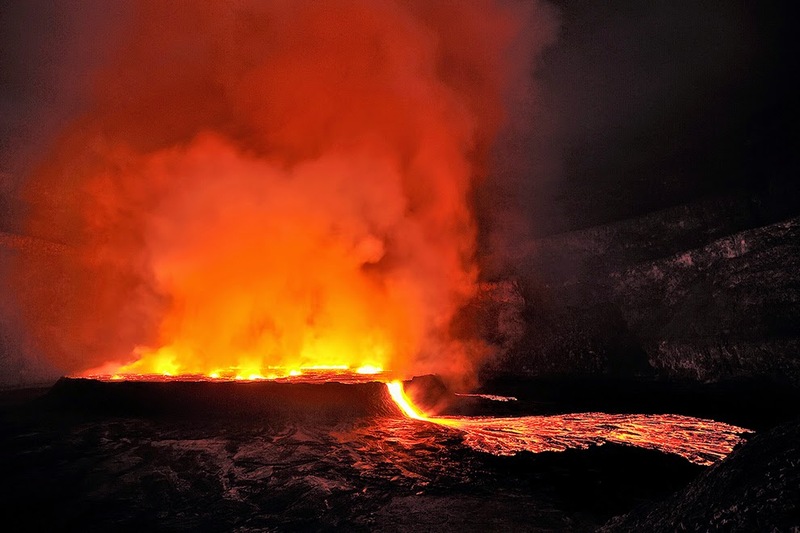 Well, the one such disaster happened in 1977, when the walls of the crater burst open and the lake of molten rock drained in less than an hour, pouring itself down into the villages at a frightening speed of up to 60 mph. 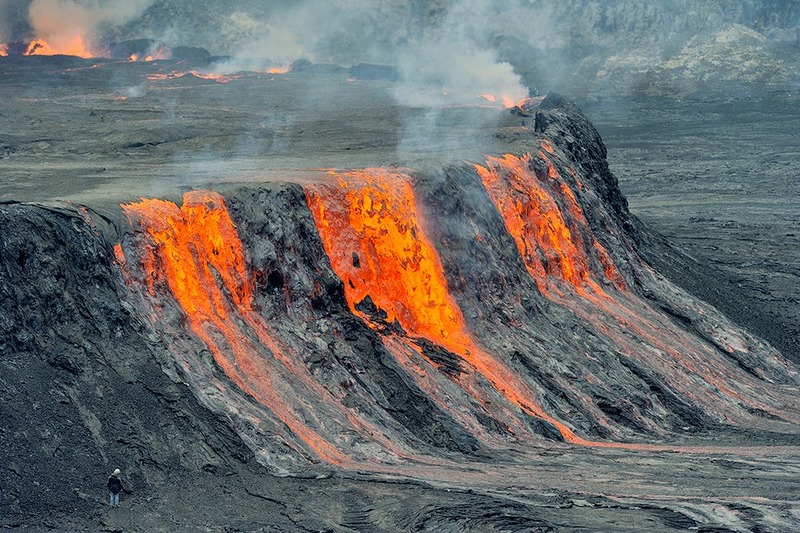 Different your average lava flow, the exclusive presence of an alkali-rich volcanic rock, melilite nephelinite, creates a extremely fluid consistency, allowing it to move at speeds that can with no trouble overcome anything in its path. 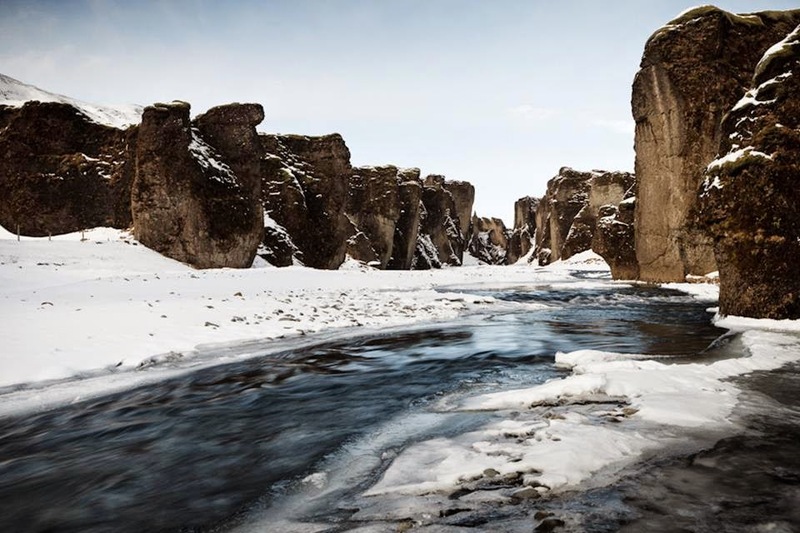 The official death toll was 70, but numerous report states much higher numbers, some guessing the losses at several thousand. 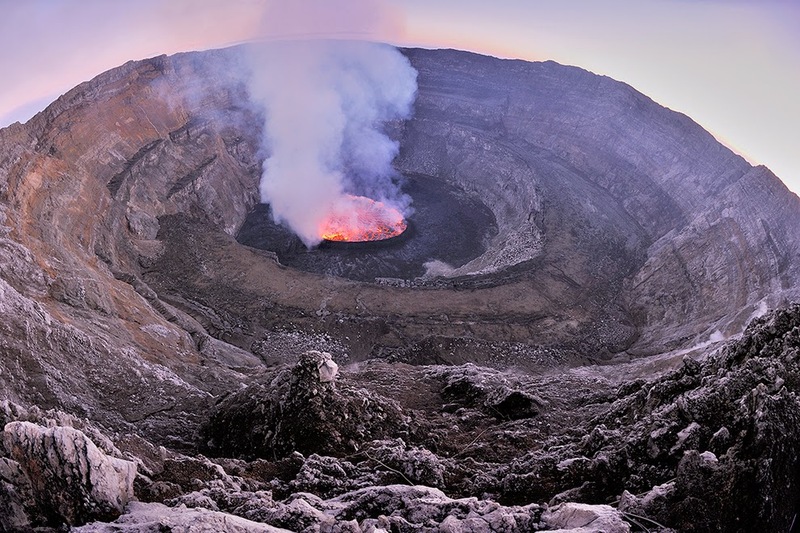 The dreadful eruption of 1977 took place when the lake was at its maximum depth ever recorded, 10,700 ft., but the extent of its volume varies depending on activity. 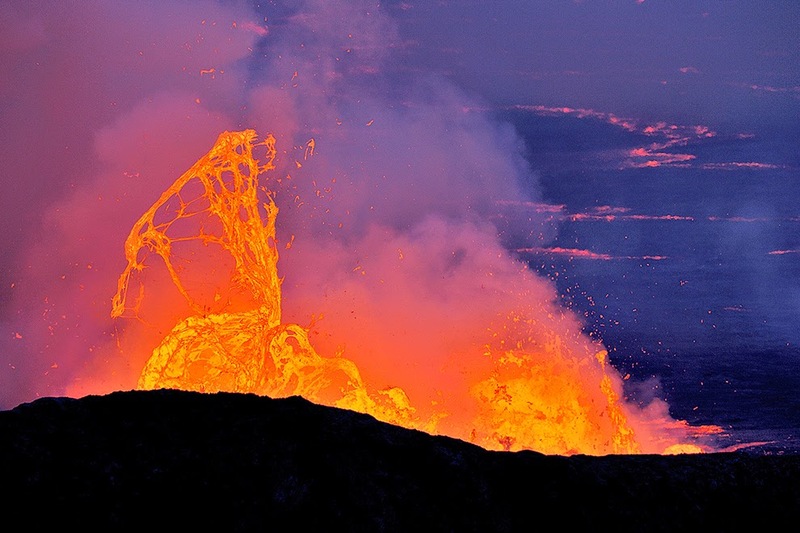 Because no one exactly knows how long the volcano has been active, but history tells us since 1882 it's been very busy, erupting more than 34 times, sporadically bubbling and spewing fire for years before settling down. 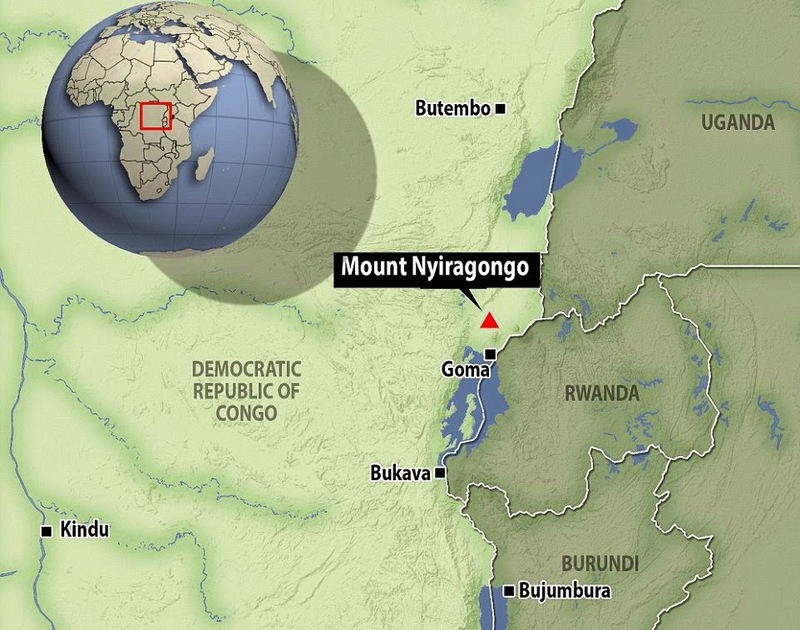 It is located inside Virunga National Park about 20 km. 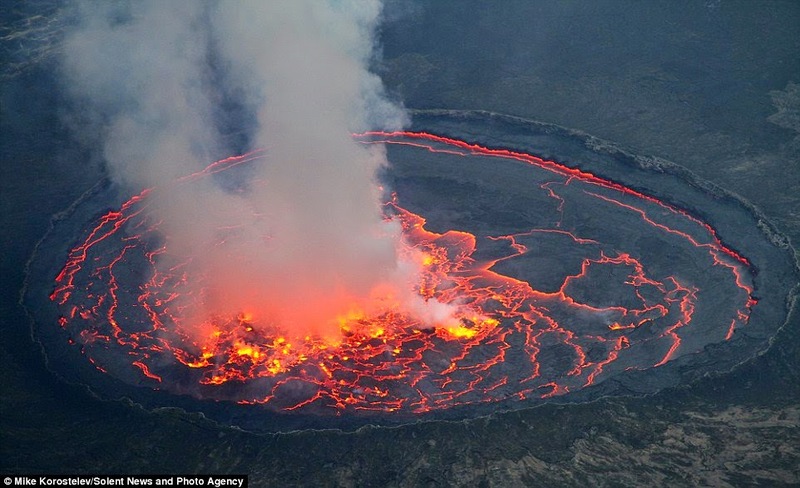 North of Goma, Mount Nyiragongo is now still active, its last deadly eruption taking 147 lives in 2002. 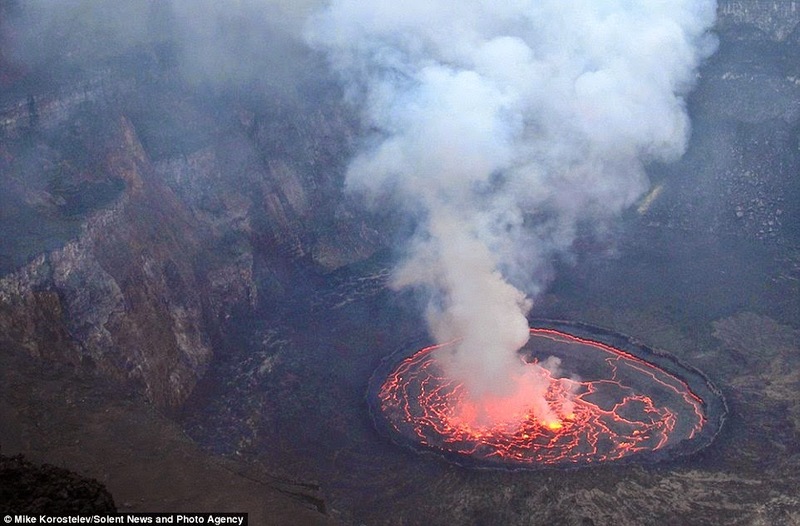 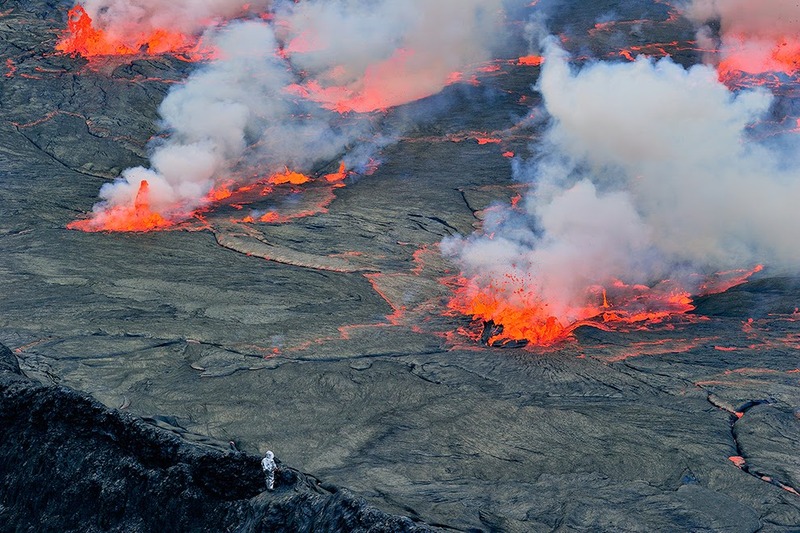 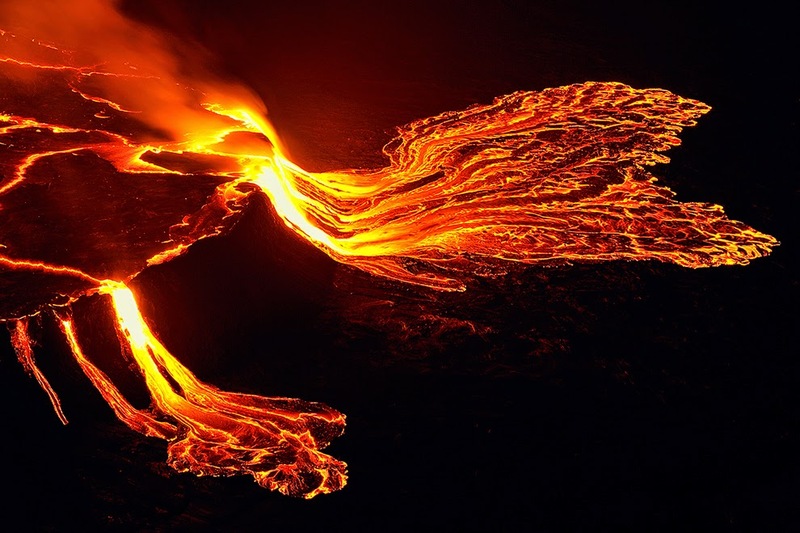 Its activity is, for now, being confined to the crater, where the lake of lava is slowly rising once more. 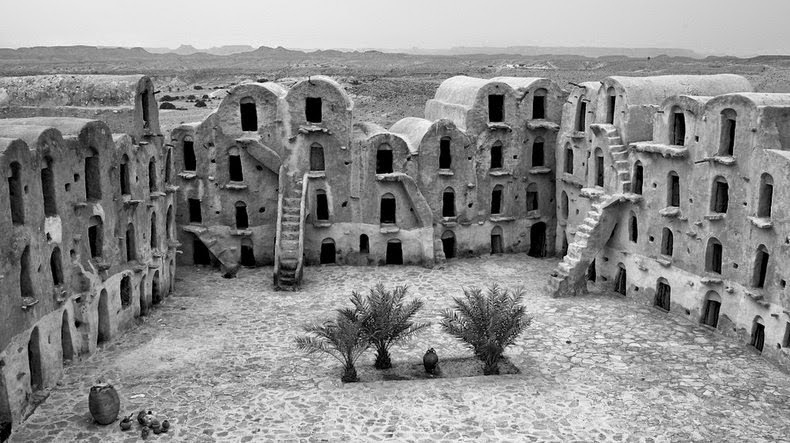 Ksar Ouled Soltane is located approximately 20 kilometers south of the city of Tataouine, in southern Tunisia. 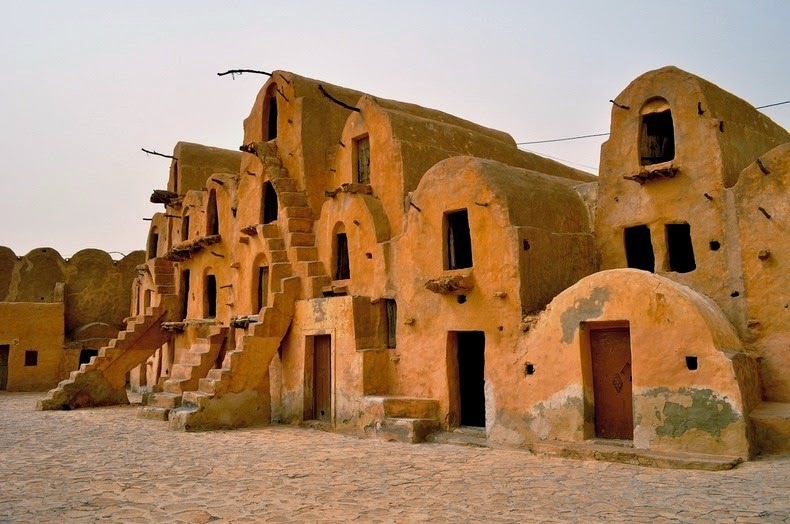 This is an attractive and perfectly preserved fortified granary well built by the Berbers in the 15th Century. 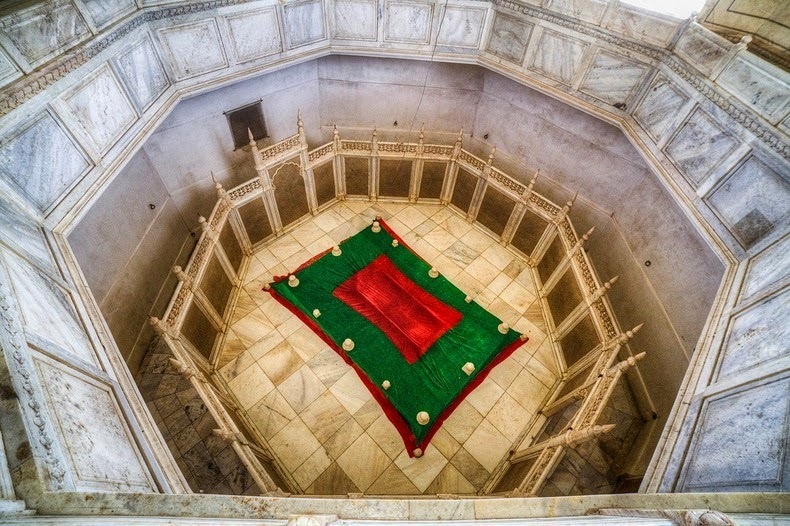 This is built with adobe; the ksar is spread out over two courtyards, each of which has a perimeter of multi-story vaulted granary cellars called ghorfas. 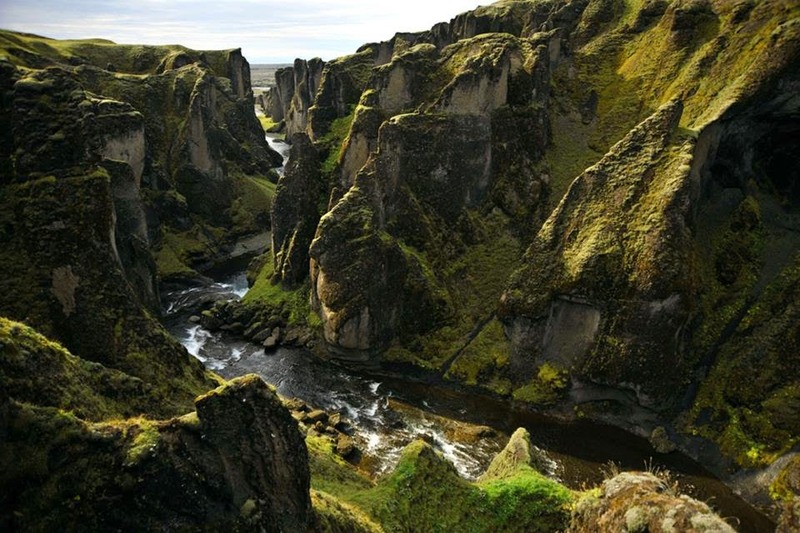 In those unruly Middle Ages, granaries were frequently fortified to stop raids on a village's food supply. 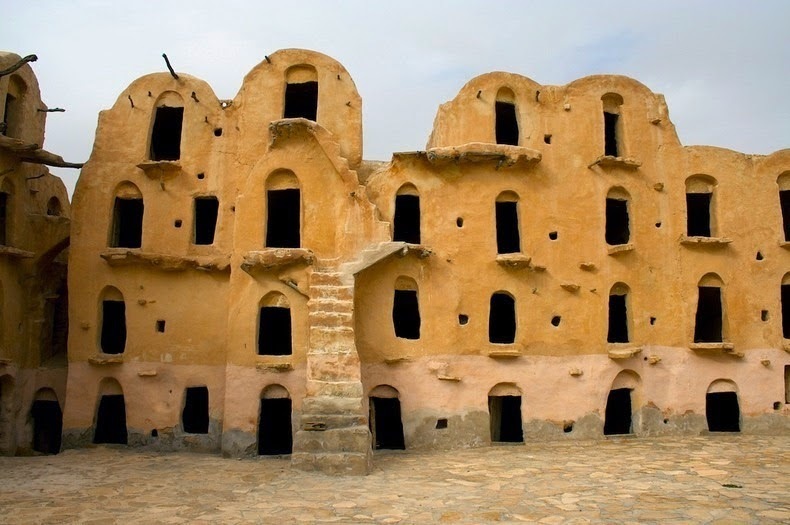 Such as other granaries created by North African Berber communities, Ksar Ouled Soltane is located on a hilltop, to help protect it from raiding parties. 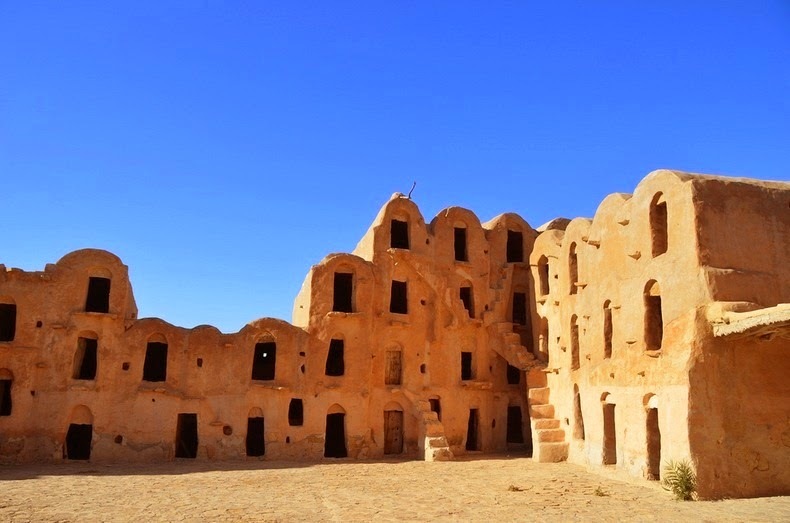 Ksar Ouled Soltane was originally built in the 15th century and had myriads of ghorfas for storage of grains. 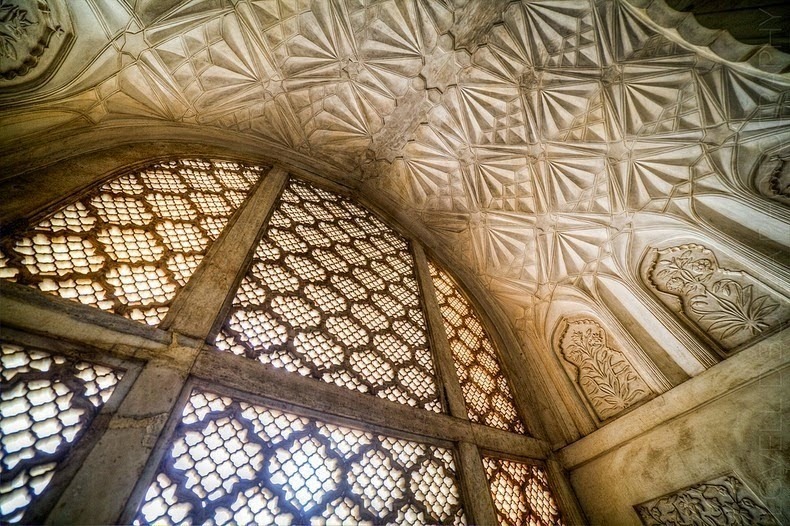 Therefore later in the 19th century, the ksar was stretched into a second courtyard, and the quantity of ghorfas increased to around 400. 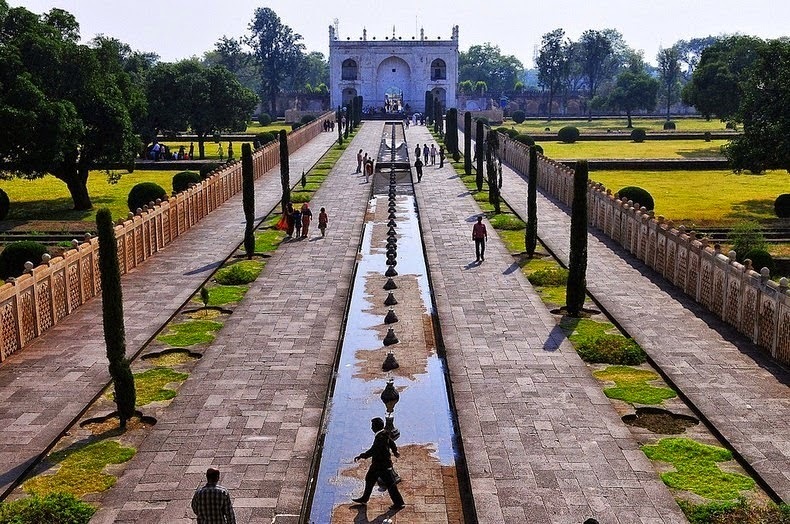 The two courtyards are interlinked by a passage made of palm wood. 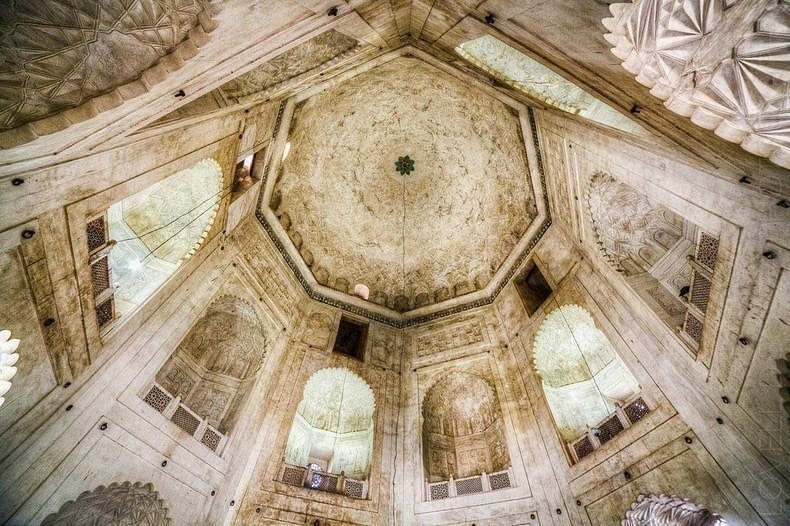 The ghorfas are four stories high and reachable by steep external stairs that reach up one by one to the single doors. 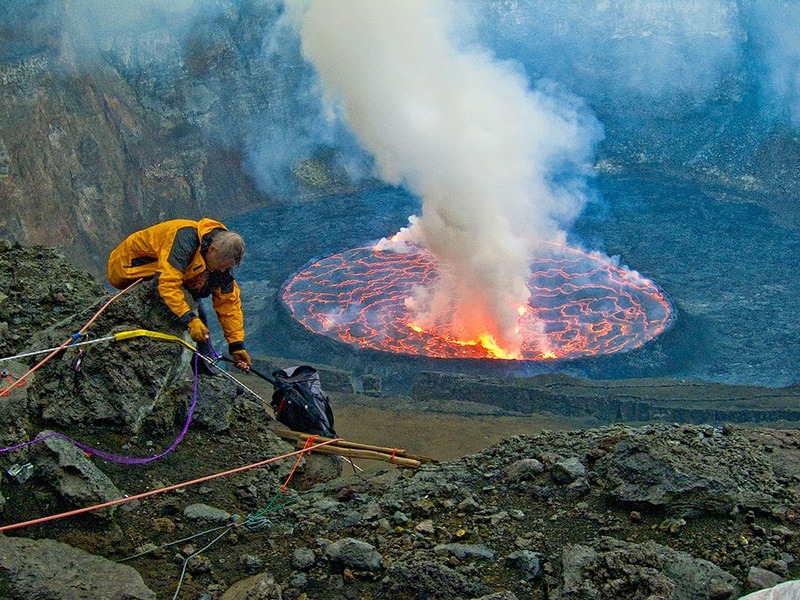 Each ghorfas was assigned to and used by a single family. 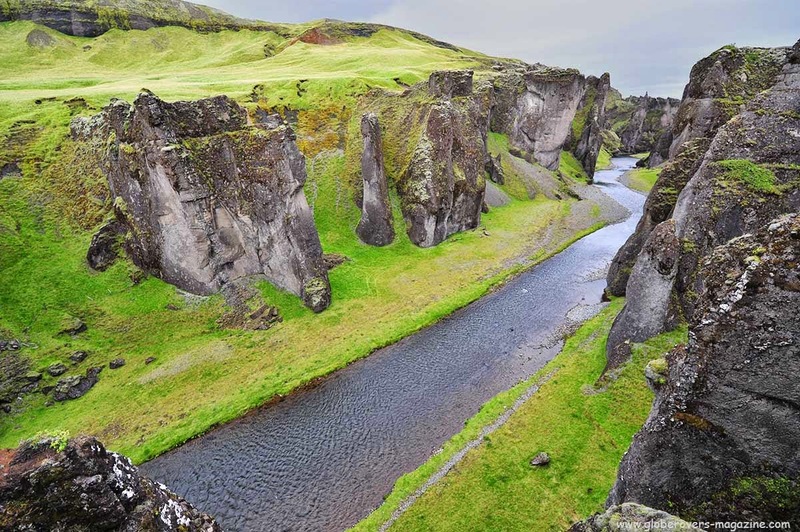 So more than five hundred years, the nomadic tribes used them to store grain and olives. 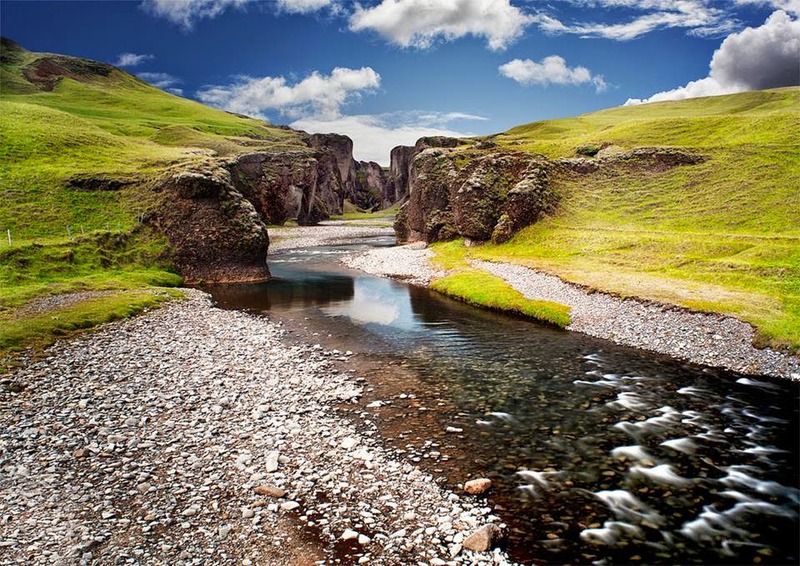 However on Friday afternoons the courtyard functioned as meeting places for the community, the majority of whom spent most of their year in the pastures with their goats, sheep and camels. 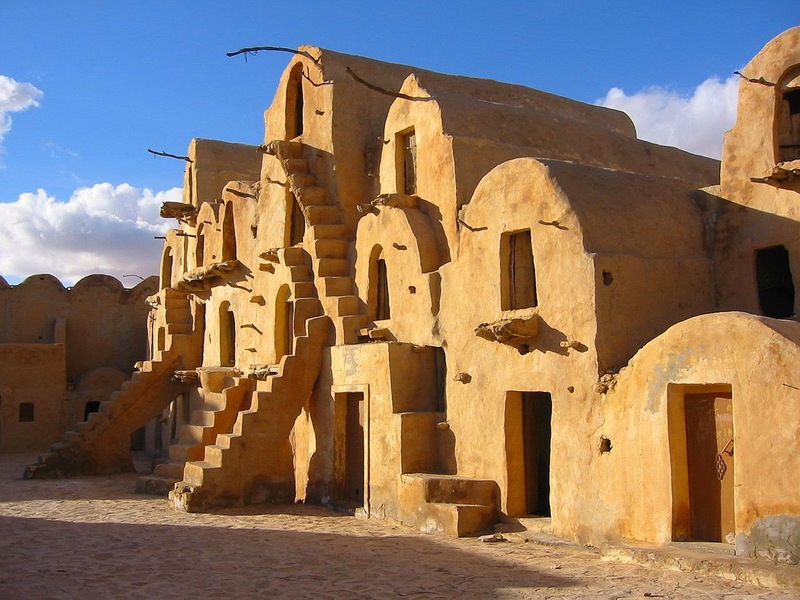 Ksar Ouled Soltane appeared in the Star Wars movies as slave quarters where Anakin and his mother lived in the Phantom Menace. 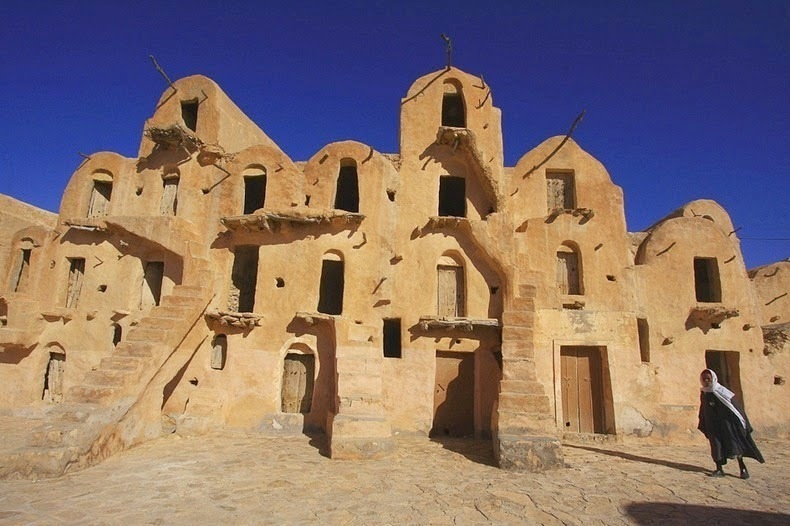 With the passage of ups and downs, The Ksar was needed to repair in 1997 and restored to its original state, though with cement rather than the original materials of mud and brick. 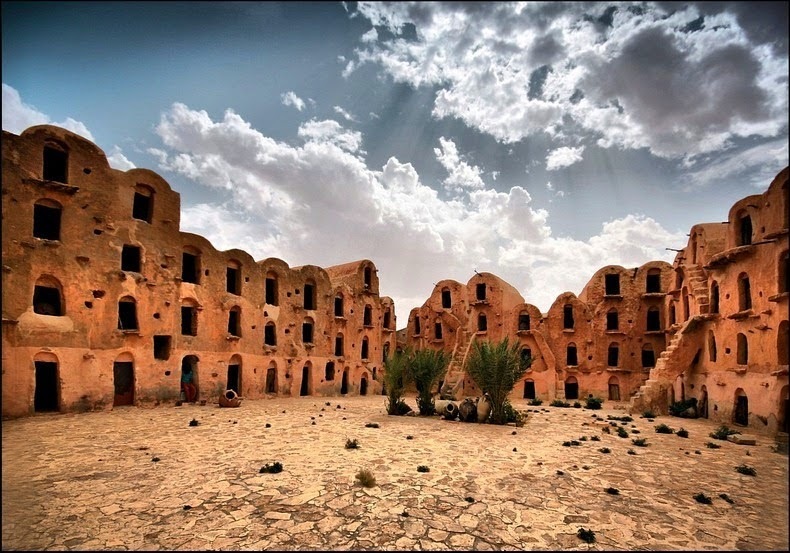 It is now a popular tourist destination in Tunisia with visitors coming to see its well-preserved granary vaults. 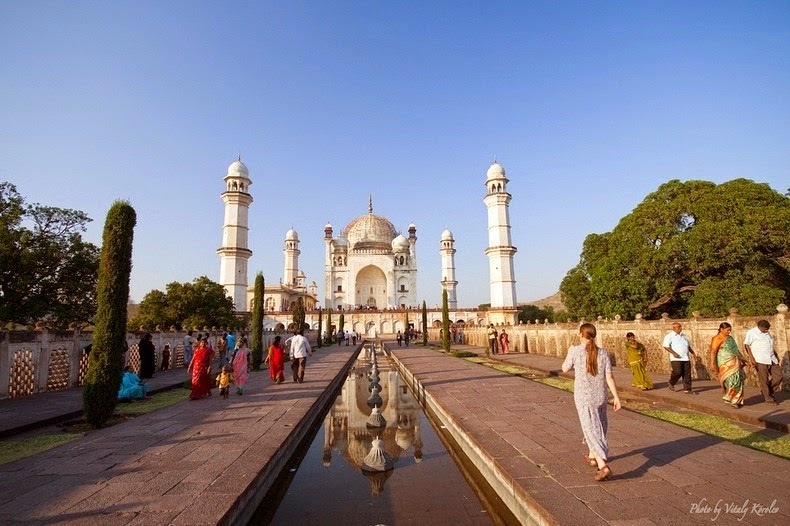 There’re very few peoples know; that India has not one but two Taj Mahals? 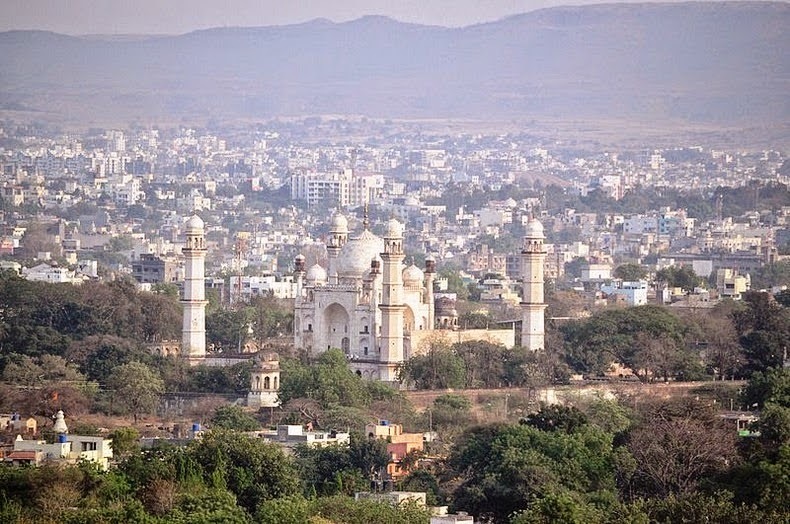 Yes; indeed, there’s a monument indistinguishable to the Taj Mahal that remains in Aurangabad in Maharashtra. 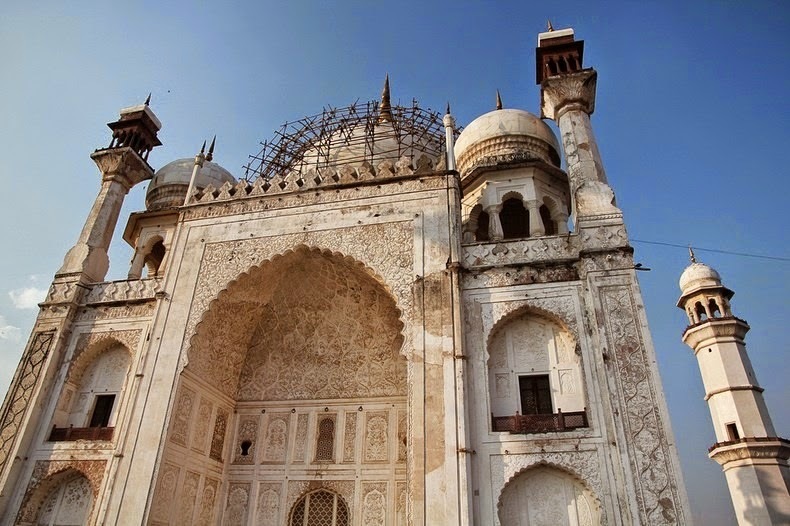 This is very attractive mausoleum named “Bibi Ka Maqbara” (Tomb of the Lady) actually built by Prince Azam Shah, the son of the sixth Mughal Emperor Aurangzeb, between 1651 and 1661 A.D, in the memory of his beloved mother, “Dilras Banu Begum”. 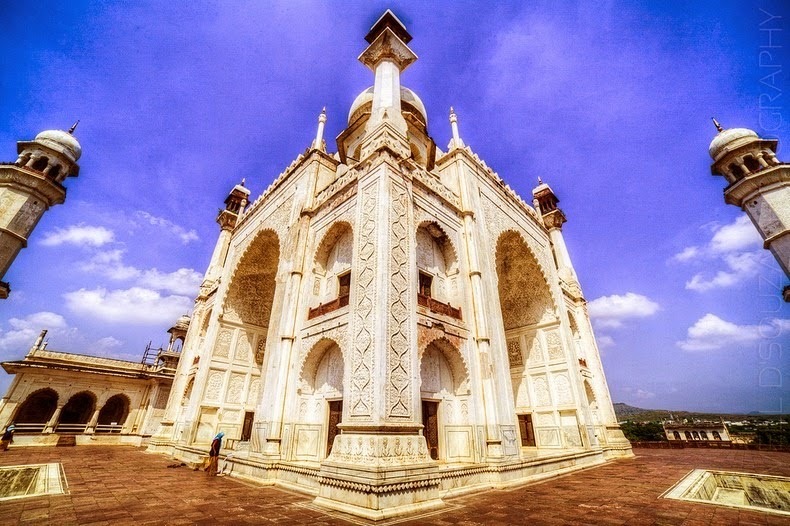 The tomb draws its inspiration from the renowned Taj Mahal of Agra built by none other than Prince Azam Shah’s grandfather, Mughal Emperor Shah Jahan in memory of his wife Mumtaz Mahal. 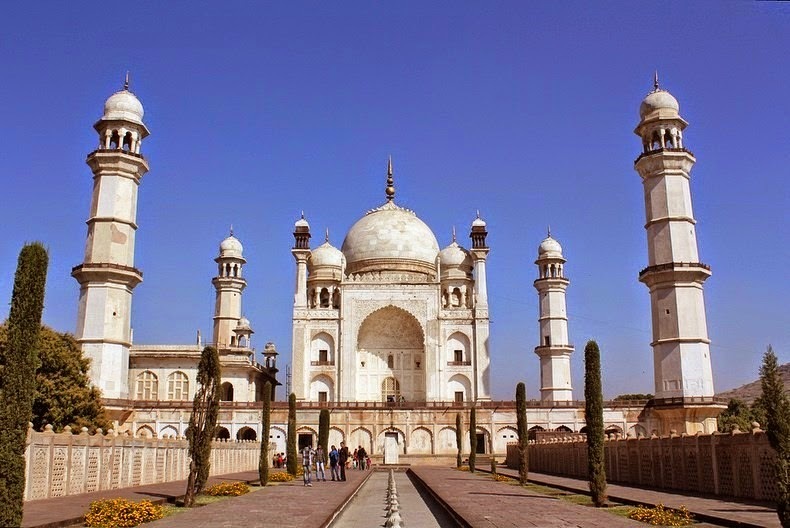 Azam Shah proposed to build a monument that would rival the Taj Mahal. 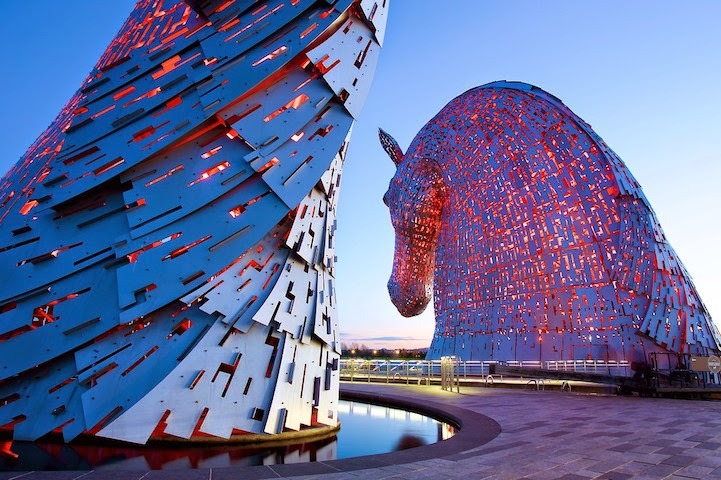 Unluckily, he lacked the treasury his grandfather had access to, as well as the trained labour the treasury bought, resulting in a meager copy of the latter. 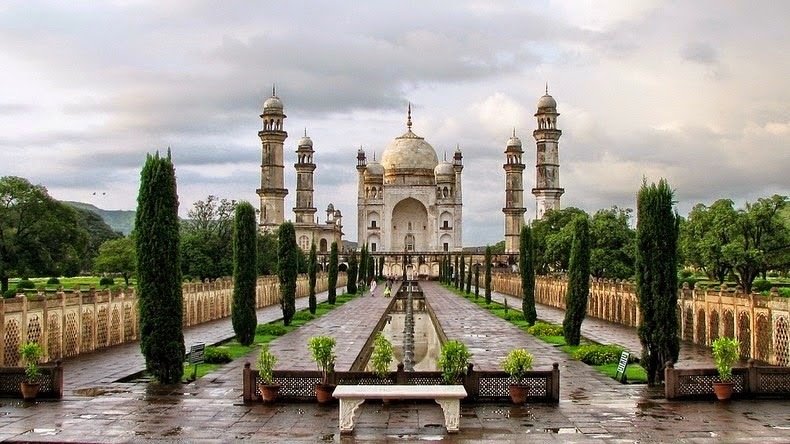 However; without any doubt “Bibi Ka Maqbara” is an architectural wonder with sophisticated designs, carved motifs, impressive structure and prettily landscaped Mughal-style garden. 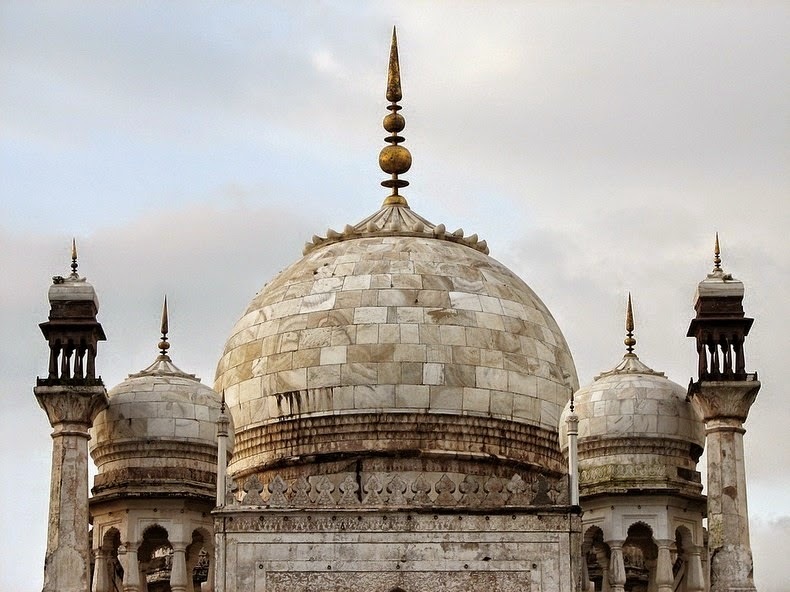 Due to its robust resemblance to the Taj Mahal, it is lovingly named the “Taj of the Deccan”. 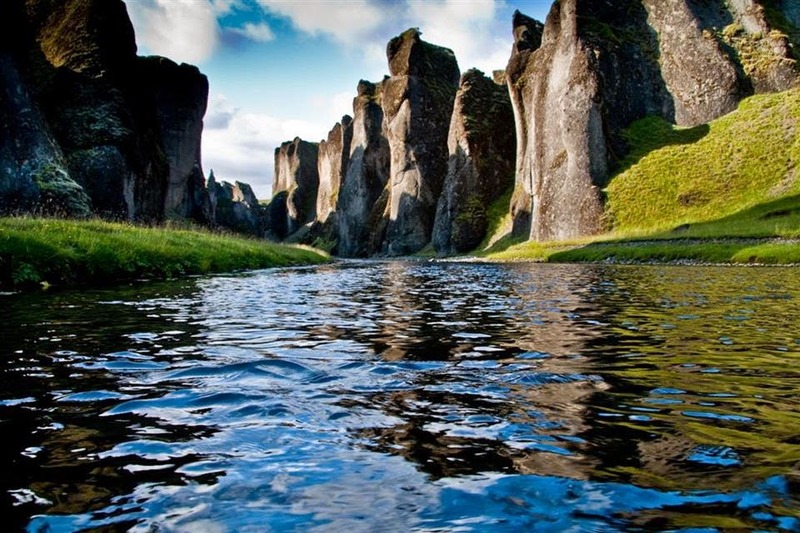 A lot of travelers believe Iceland is the heaven on the earth due to its natural beauty. 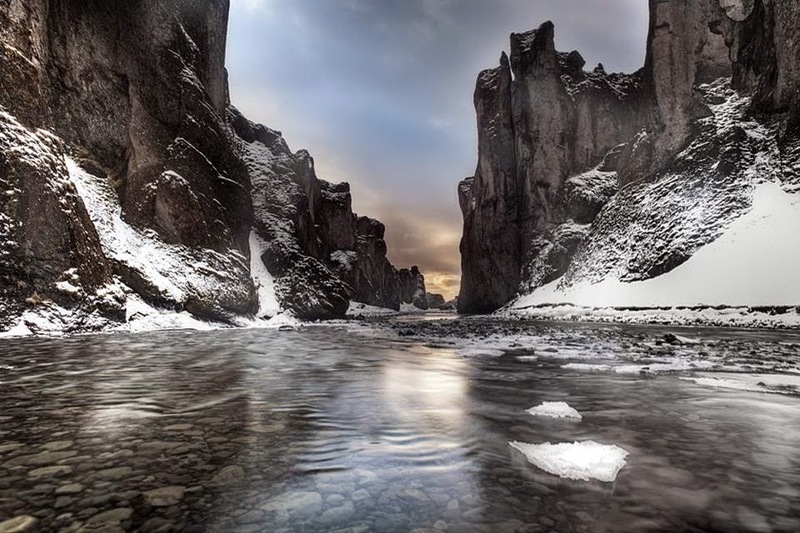 And Fjaorargljufur Canyon happens to be one of the most widespread tourist attractions in Iceland. 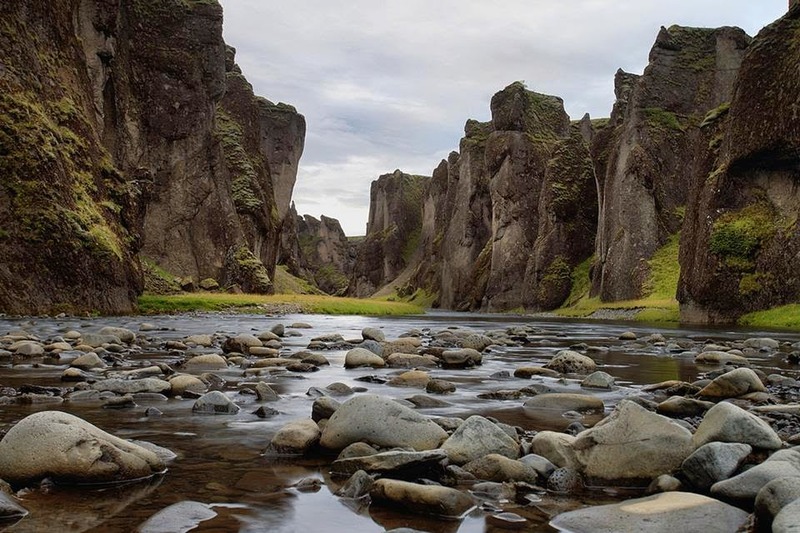 The majestic and scenic beauty of this area is definitely enthralling travelers and local people thinks these canyons as a part of dreamland itself. 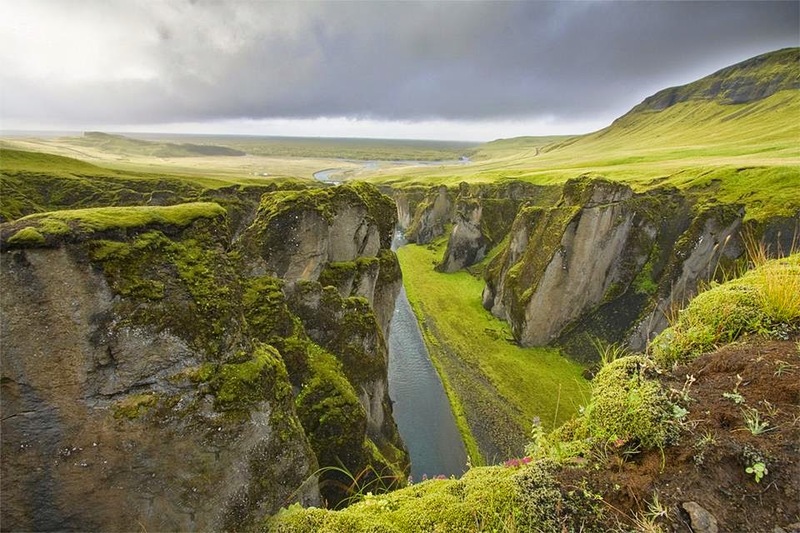 Moreover, the best part of this place lies in the fact that it is very easily accessible even if it is a canyon. 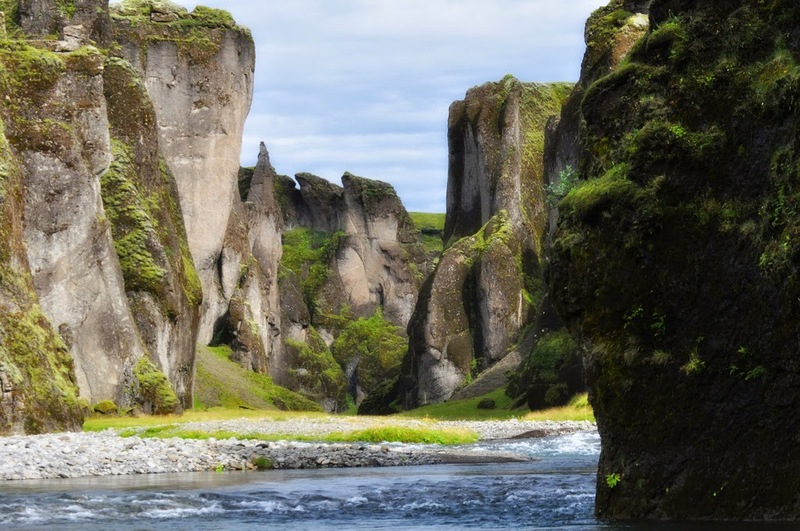 Moving westwards from Kirkjubaejarklaustur hamlet and going towards the southern direction will take a person straight to the Fjaorargljufur Canyon. 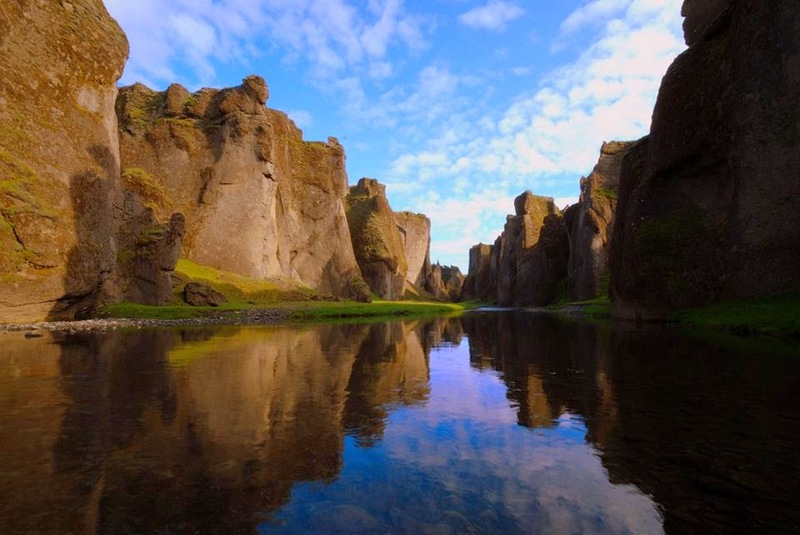 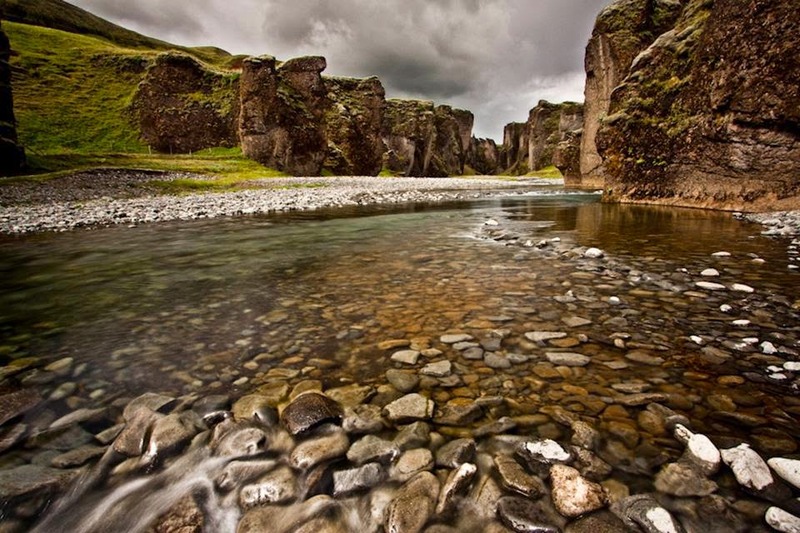 Dimensionally, Fjaorargljufur Canyon is 100 meters deep and two kilometers long. 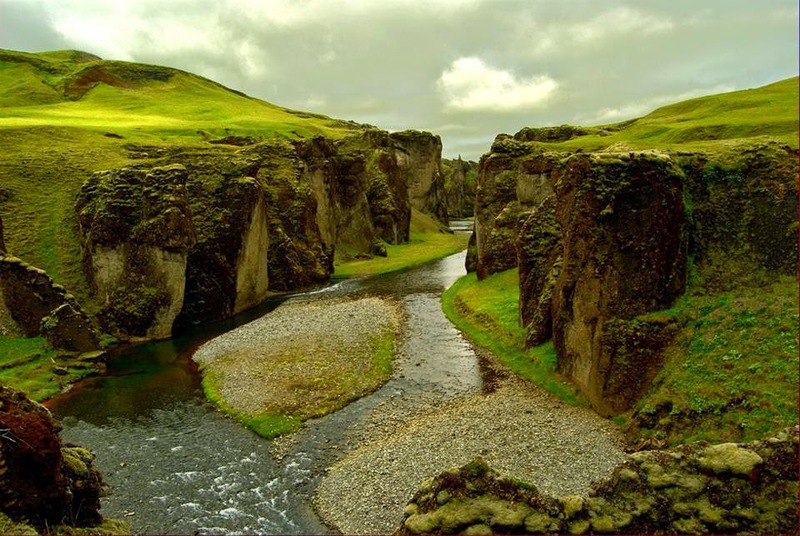 River Fjadra flows through the canyon and falls in the vicinity of Ring Road. 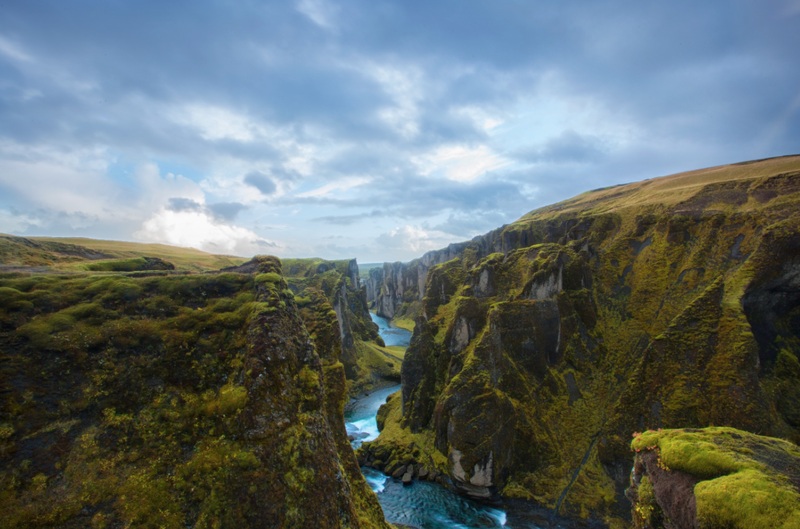 The history tells us, the canyon was ultimately created after repeated occurrences of erosion as a result of the water that flows down from the glaciers. 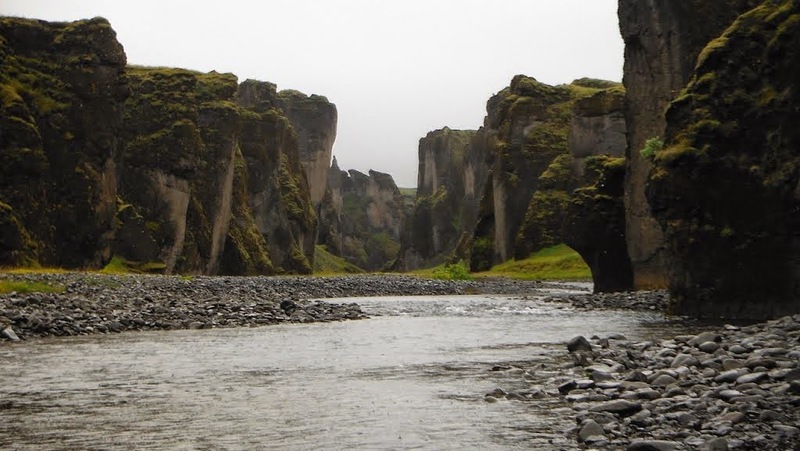 This water from the glaciers flows down through the rocks and crevices. 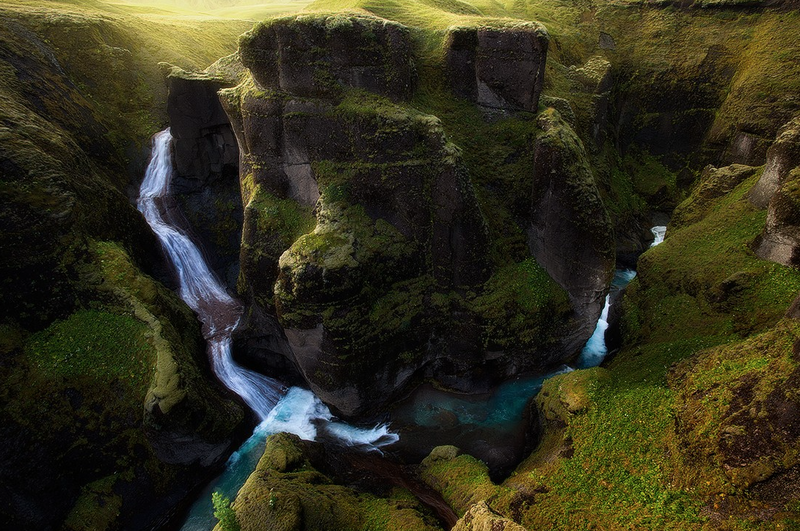 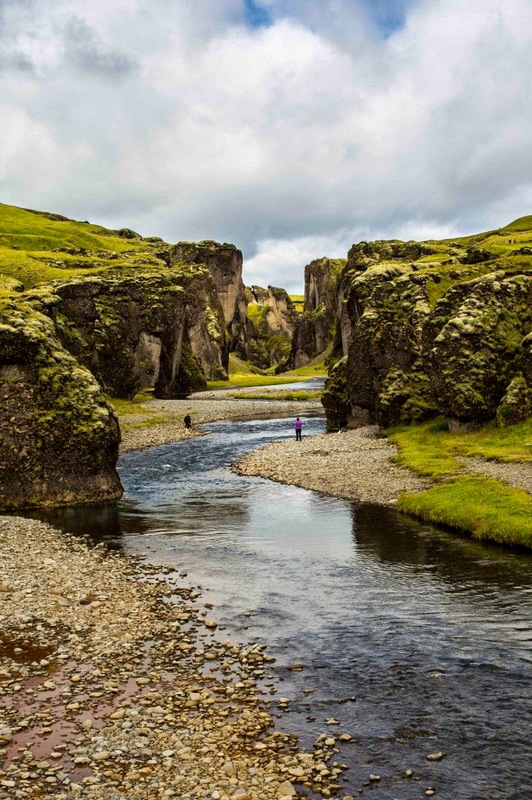 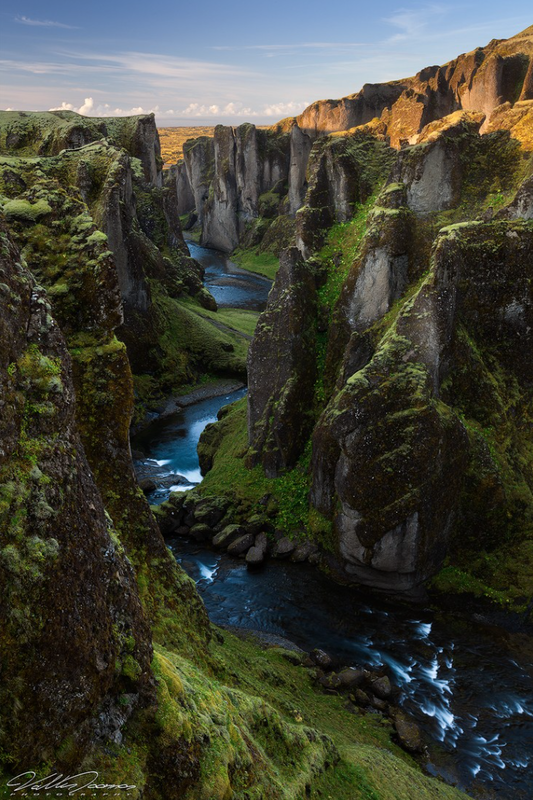 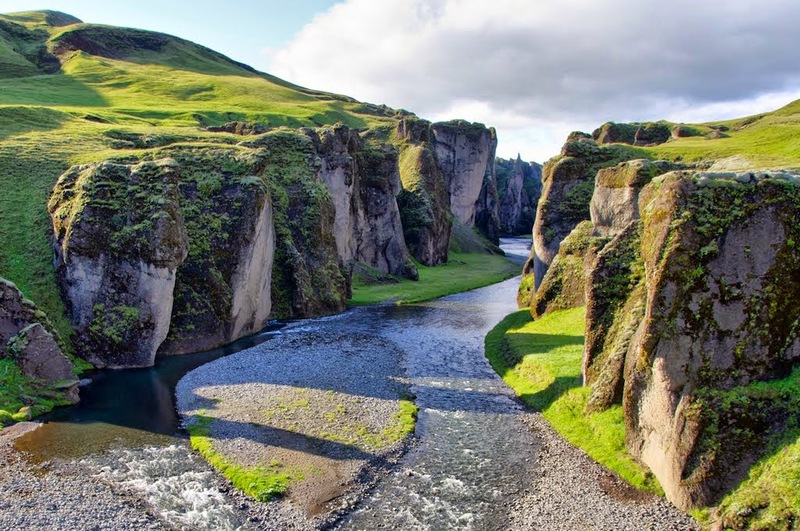 For thousands of years, this canyon has seen fresh water from the glaciers and sightseers from all corners of the world wanted pay a visit to Fjaorargljufur Canyon, Iceland. 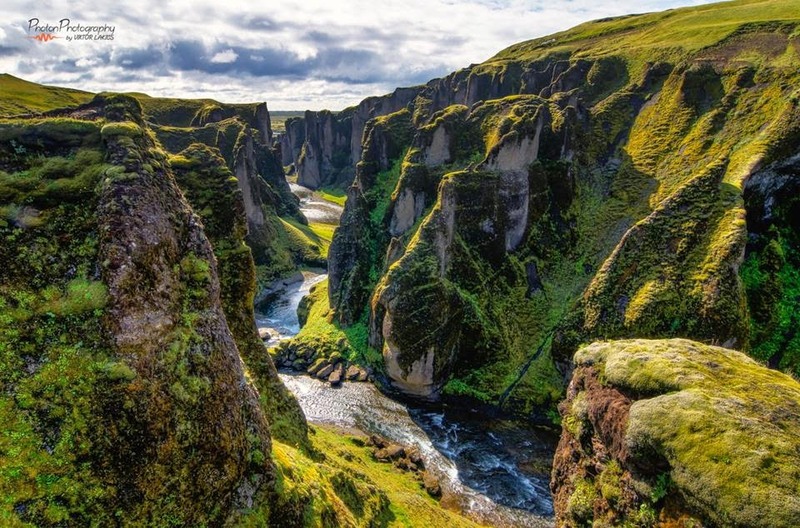 So here you may have seen allot of stunning and gorgeous Canyon’s around the world, but in all our travels this is possibly the most Attractive Canyon in the World. 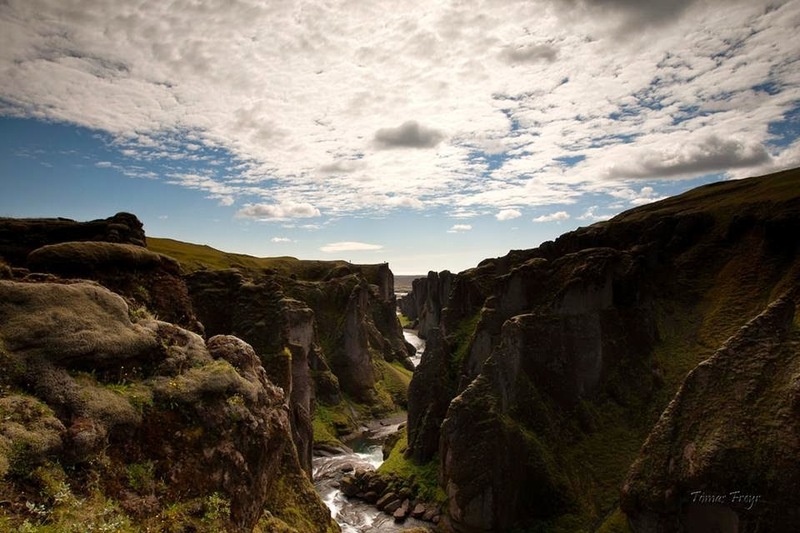 It is completely unpronounceable by the way, and you can find it in Iceland.